What a beautiful book. 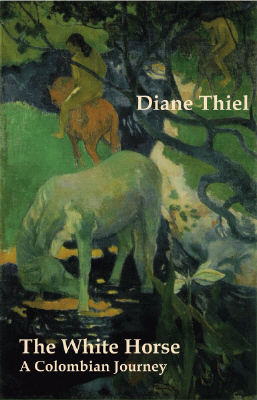 I knew it was going to be poetic--Diane Thiel is going to enjoy (and endure) one of those epic poetry lives--but I was knocked over twice by its compelling narrative drive and quiet sense of humor. Diane Thiel writes about the Chocó rainforest the way migratory geese fly--with clarity, economy, and precision, with a feel for the contours of the land, with the brace of sun, air and sea on her skin. She threads a triple obsession in this beautiful meditation of a book: her love of people, landscape and poetry--in prose at once urgent and meditative. Her consciousness is a moral one, as seen in her portraits of dispossession, but her writing is obedient to one master--the truth of an inquiring heart. The White Horse deserves a place among the classics of Pan-American annals. From the white horse appearing like an apparition--to the massive skeleton of a whale on the coast, Diane Thiel's The White Horse: A Colombian Journey takes us on a magically real journey into the Pacific Coast rain forest of Colombia. Part travel narrative, ecological essay, history, and memoir, this book allows us to experience a reality stranger than fiction, reminiscent of Gabriel Garcia Marquez's comment that he makes nothing up, just writes down what the people tell him. Moving through this remote, enchanting, but also troubled region on foot and by canoe, Thiel introduces us to the landscape and the intriguing and inspiring people she meets, such as Neftali, who is knocking his house apart to build a boat because El Señor told him to do so. Erudite, passionate, humorous, and mysterious, Diane Thiel's writing beckons us deeper into the heart of the forest, re-awakens our consciousness about the natural world, and evokes the spirit of adventure.